Sigh. 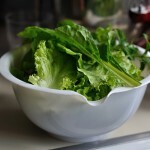 Sometimes the light in our kitchen is just right, and taking photos is nearly effortless. The light in these came out perfectly, why can’t it be like this all the time? We’ve been slowly widdling down the veggie and fruit onslaught, and after a particularly rigorous workout Saturday morning decided we needed protein like woh. Other than hot dogs from our camping trip, we haven’t had meat in our house for nearly a month, so we quickly turned to eggs and decided to make a veggie-infused egg salad. 1. Place eggs in a saucepan and cover completely with cold water. Bring water to a boil. Cover and remove from eat, and let eggs stand in hot water for 10 to 12 minutes. 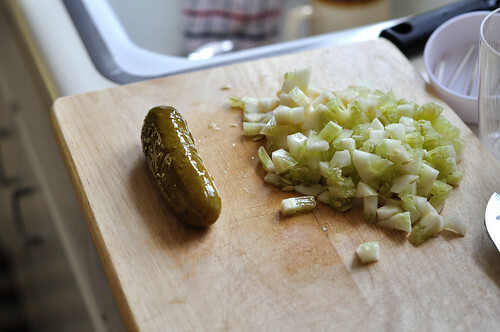 Remove from hot water, and cool. 2. 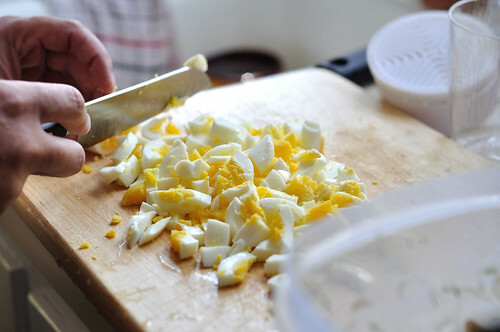 Peel eggs, chop, and transfer to a medium bowl. 3. Cube cucumbers and pickled cucumbers and add to eggs. Mix in mayonnaise, seasoning salt, paprika, and pepper. Refrigerate until thoroughly chilled. 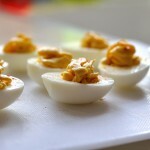 Neil adds: If you are looking to healthify this recipe further, use egg-whites only and less mayo. Enjoy! I agree, you’re lighting is just perfect. 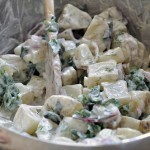 Beautiful photo and the recipe sounds delicious. Thank you so much, hope you gave it a try! 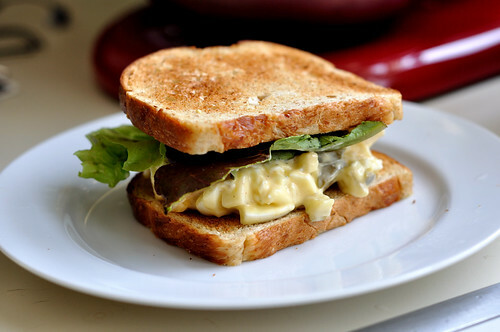 Mmmm, egg salad sandwiches are one of my favorites! I’ve never though of adding cucumbers. It would add a nice, fresh crunch! 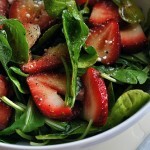 It does add some nice crunch, and a slight sweetness that I LOVE! I forgot to mention that the pictures are great! I love when the light is shining in just the right amount. I’m not going to be able to photograph our dinners this winter. Ugh. Good sandwich. Definitely needs the pickes though, otherwise can be a little bland. 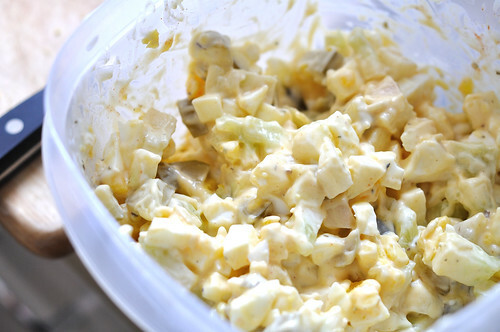 Now that I’ve had egg salad with pickles, I definitely agree that all egg salad without it is extremely bland. 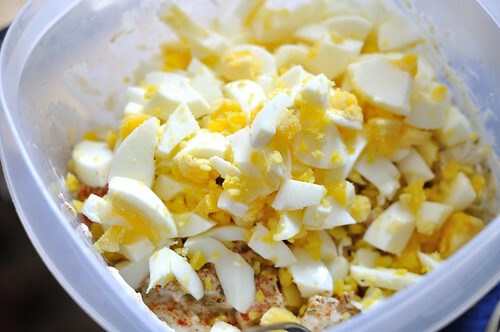 This was a pretty good egg salad. 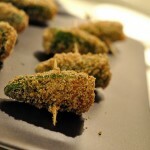 I enjoyed it and it allowed me to use up a cucumber in the fridge that needed a tasty home. 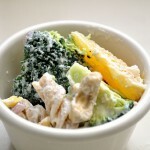 I have a recipe for chicken/egg salad that calls for green grapes and tarragon. 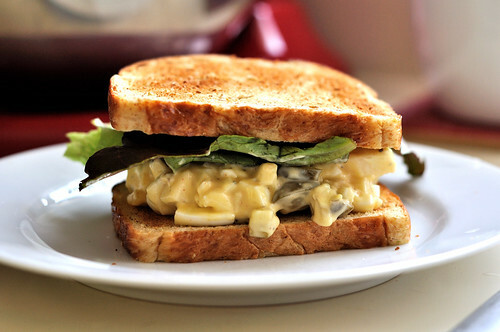 Those are by far my two favs for sandwhich salads. How many servings of egg salad does this yield? I think it’s a safe 3 sammich servings in my opinion. Formal nutrition would probably say 4.